The analysis is based on estimates from the just-released 2018 edition of PQ’s annual consumer media-spending report, which shows that consumer spending on media content and technology continues to outpace the ad industry’s contribution. 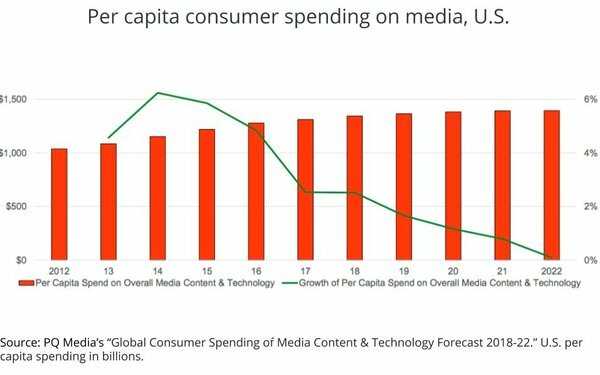 In the U.S., consumer spending now accounts for about 55% of the cost of media versus ad spending’s 45% -- the highest disparity since PQ Media began tracking the trend. Much of the shift is attributed to consumers spending more on both premium content and media technology, but on a longer-term basis, PQ does see a gap between advertising and consumer spending "decelerating" as direct consumer outlays begin hitting the wall. Conversely, Quinn says advertising and marketing trends historically are driven primarily by “macroeconomic variables” and “cyclical drivers,” such as quadrennial political and big sports events spending. That said, PQ continues to see a constant rate of expansion for consumer spending on media, which is projected to approach about $300 per month per U.S. household in the next few years. Based on PQ’s current forecast through 2022, annual U.S. per capita spending will reach $1,394.81 in 2022, or about $295 monthly per U.S. household. While the U.S. remains one of the highest consumer media-spending markets in the world, it was surpassed this year by Japan. “The U.S. remained the world’s largest market for consumer media content, access and technology, generating $442.7 billion in 2018,” PQ’s new report estimates, noting: "On a per-capita basis, Japanese consumers will spend the most on consumer media, reaching $1,360.11 in 2018, replacing the U.S. as the top spending nation with an average of $1,344.55 per person. Russia will post the fastest growing of the Top 20 markets, rising 11.3% in total spending and 11.2% in per-capita spend this year, while the U.S. market will be the slowest growing, up only 3.3% and 2.5%, respectively."